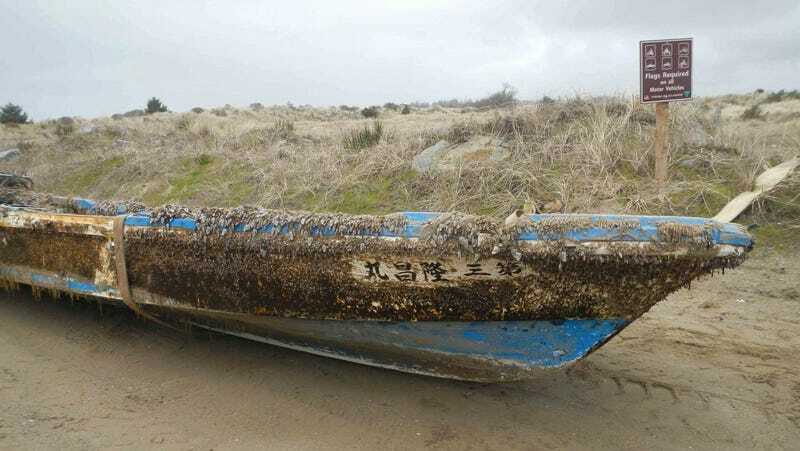 A boat from the 2011 Japan tsunami that washed up on the coast of Oregon, barnacles and all. In 2011, a colossal tsunami set off by a magnitude 9.0 earthquake slammed into the eastern shores of Japan. Not long afterwards, some of the 1.5 million tons of floating debris created by the waves, from buoys and boats to entire fishing docks, began washing up along America’s northwest Pacific coast. As revealed by a recent study, dozens of species of algae—globally abundant, as well as those found in Asia and across the northern Pacific—snuck along on this debris and turned up in Oregon and Washington. Spending several years collecting, classifying and observing these tiny beasties, researchers found that most of them were opportunists that had arrived in an environment not dissimilar from their starting points. Had they been given the chance, a full-scale invasion of this brave new world might have taken place. Algae might not sound like much of a danger, but don’t forget that these little critters can disrupt entire regions when they get out of hand. Just look offshore from Florida’s gulf coast, where a red tide bloom has slaughtered wildlife and devastated the tourist industry. It’s even become a hot button issue for voters there in this week’s midterm elections. That’s why this (fortunately averted) incursion matters. Writing in the journal Phycologia, the researchers suggested that if it weren’t for an extensive and prompt clean-up operation, many of the invaders were likely to have quickly colonized their landing sites. Although it’s been previously acknowledged that species can ride buoyant debris thousands of miles across the ocean, a 2017 study on the Japanese tsunami was one of the first to document it happening in real time over such a huge scale. It revealed that nearly 300 larger species, from crabs and sea stars to sponges and fish, turned up alive in North America and Hawaii. This new study proves to be an equally eye-opening companion piece. Sea slugs from a Japanese ship that washed up in the Pacific Northwest in 2015. Lead author Gayle Hansen, a marine phycologist at Oregon State University (OSU), explained that the first piece of biota-carrying debris found was the Agate Beach dock, which turned up in June 2012, just over a year after the tsunami occurred. Immediately starting to gather specimens, they ultimately captured 42 pieces of debris between 2012 and 2016 as they washed up in the Pacific Northwest. The debris were found to contain a staggering 84 different species and varieties of algae and cyanobacteria. “We did not expect debris to arrive with hitch-hiking biota as we did not think the Japanese species would survive the cross-Pacific journey,” she told Earther. Of these, 83 percent were reproductive and dropping spores on examination, while all were capable of becoming fertile. Although many were short-lived, they often had a high colonization potential. Some species had been seen in the Pacific Northwest before, but others were alien, and several were known to be incredibly effective at invading new territory. All things considered, Gayle—along with colleagues at Kobe University—concluded that 49 percent of the species that arrived represented an invasion threat to the region. This invasion may have been cancelled, but Hansen referred to numerous earlier examples that hint at what may have transpired. A classic example can be found in Hawaii’s Caulerpa taxifolia algae: after having been accidentally introduced to the Mediterranean by an aquarium, it colonized large swaths of the shallow subtidal area, outcompeting the local seagrass. The fish, not willing to eat the toxin-producing invader, experienced a precipitous decline in their populations. Chapman noted that the vast majority of algae are small, which makes them difficult to identify or even detect. This study also found that the smaller species proved to be the longer-term survivors, and were more likely to succeed in invading. This is all problematic, as these critters are likely to be influencing ecosystems in ways that aren’t yet recognized. This article has been updated to clarify that 83 percent of algae varieties the researchers examined were actively reproductive, while all were capable of becoming fertile.